Achieve invites you to join us for our 3rd Annual Tagawa Gardens’ Spring Give Back Program to raise money for childhood cancer research through the Summer’s Way Foundation. Achieve Parent Sounding Board (APS Board) is our program’s booster organization. Fundraisers are designed for YOU! No one is required to participate in any fundraiser we offer. Funds typically go to gymnastics-related expenses, such as competition fees, practice leos, tuition and more. 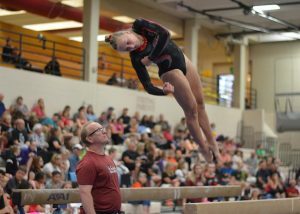 Throughout the year we provide fundraising opportunities for Achieve Gymnastics members through our Parent Boosters Club. The majority of our fundraisers benefit participants as well as the Boosters Program and participation is voluntary. We offer a variety of fundraisers at different times of the year. Here is a list of fundraisers that we have done in the past along with the general time of year that we did them. Our annual Butter Braids fundraiser is typically around February. A portion of each Butter Braid sold goes back to your individual Fundraising Account. For more information, stop by the Front Desk. We frequently run this fundraiser in the Spring to support Childhood Cancer Research and near the Holidays for their Poinsettia sale. We tend to run this in conjunction with our Annual Team Pictures. 50% of everything spent at Chipotle on our given day and time goes directly to our program. It is a great opportunity for us and the money we make benefits everyone in the gym! We have King Sooper’s and Kohl’s gift cards available for purchase, year round, at the Front Desk. Kohl’s cards are available in $50 and $100 denominations, and King Sooper’s cards are available in $100 denominations. You receive a 3% rebate to your fundraising account from each card purchased. ShopWithScrip is an online fundraiser for purchasing physical retail gift cards, e-gift cards (ScripNow) and reloadable cards. ShopWithScrip works with approximately 300 retailers across the United States. They purchase the cards from the partnering retailers. Retailers offer rebates for purchasing physical, ScripNow (e-certificates) and (ReloadNow) reloadable physical cards previously purchased through ShopWithScrip. 60% of the listed rebate for each purchase becomes available to you to use the fiscal quarter after your purchase. 40% of the rebate goes to our Achieve Parent Sounding Board (Boosters / 501(c)(3)). To view the current list of retailers navigate to https://www.ShopWithScrip.com/. Our team also makes money through various other sales of team and practice merchandise and program items. All monies that the team makes gets put directly back into our program.